Few holidays changed so much in the space of just one century as Halloween has. A couple of people still alive today probably remember it as the rather unassuming Holiday of All Saints. It soon morphed into a sort of second Christmas, one in which children only receive candy. As the new millennium was approaching, Halloween became more of an excuse for adults to throw costume parties. The kiddies still get their candy, but so do grown-ups get to drink until the early hours of the morning while ogling the girl next door who’s dressed almost in a bikini “because it’s Halloween”. Whether you agree with where our society’s heading or not, things are as they are and the free market provides. You cannot have a party without drinks and since the demand for such increases around Halloween, you’re going to get a lot on offer. Both traditional labels and things that can best be classified as novelty items fill the shelves, giving you more of a headache to choose the right one for the task than to consume the actual product. Luckily, we’ve taken a look through all the best Halloween drinks reviews and narrowed down some of the things you should consider when shopping for the season. This one might raise a few eyebrows since the shape of the container is the last thing most of us care about when buying a beverage. However, decor and spooky decor at that is very important on Halloween. Humans have evolved to feel creeped out by material objects — it’s just how we are built. This puts liquids at a severe disadvantage when it comes to looking scary since it doesn’t really have a shape. Luckily, liquids can assume the shape of the object they are poured into, which could work towards giving them an additional creep factor. For example, red wine isn’t very unsettling all by itself, despite being the color of blood, but when poured into a heart shaped bottle it becomes a campy prop fit for Halloween. Bottle shape can even be used to elicit some real feeling if a little thought is put into it. To give another example, a skull shaped tequila bottle has the potential to remind people of both Aztec sacrifices and the current Mexican drug-related crime wave, both of which being genuinely unsettling. The bottle itself also is good value for money, since it can be used again and again and filled with whatever concoction the owner might have prepared for Halloween. There’s no reason to limit the spook factor to tacky decorations. As touched above, horror has a deep psychological aspect to it, which is always fun to employ for a maximum effect. It’s a sort of fashion among wine producers to label their drinks after serial killers, bloodthirsty tyrants, or murderous dictators. This can provide for an unsettling effect since it’s not really the same to drink some Cabernet Noir as it is to be drinking a 2012 Ed Gein. There are also unintentional associations to take account of since many beverage producers are known to have been popular with dictators, mafia figures, famous murderers or other such unsavory individuals. It would take some research but it might be worth it for the conversation starter alone. For the most part, this boils down to preference. Some people like stiff drinks that get the blood moving, some like to drink beer like it’s soda, people in between appreciate a good glass of wine while some don’t drink at all. Since Halloween falls right at winter’s doorstep, when the chill starts to show his bite and the cool air hits us right down to the belly, a stiff drink might prove more suitable than some bubbly beer. Those who don’t really like spirits can settle for some warm spiced wine, with a meaty grain to it. At least this is what those who plan to spend some time outside on Halloween are supposed to consider (and of course, it only applies to people living in temperate climates). It’s worth remembering that not every drink contains alcohol and there are a lot of options out there for a teetotaler or for those looking for advice on Halloween treats for school parties. The old party favorite, punch, also gets a special spooky-fy-ing treatment for Halloween. 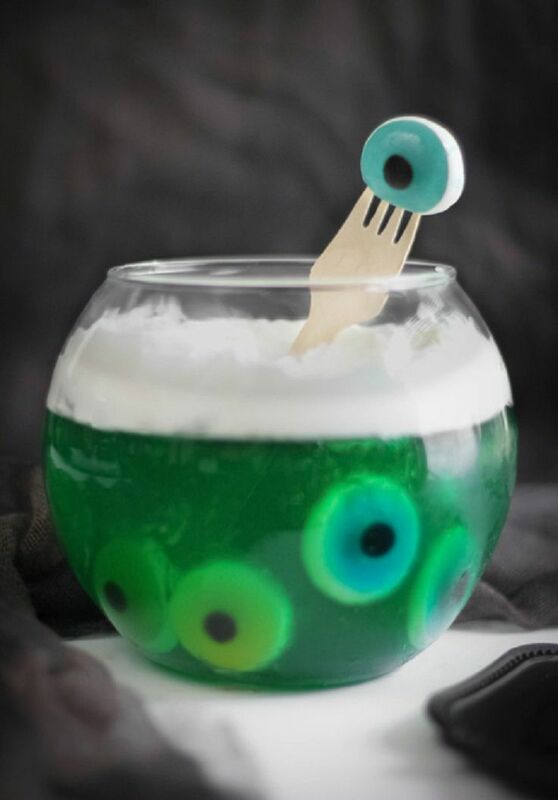 There are lots of guides to be found on the internet on how to decorate a bowl of punch with jelly maggots, fake blood, and fake eyeballs — or any other of the classics. There’s a certain way to prepare it so it develops a spooky-looking froth reminiscent of a swamp from which all the gross things mentioned above would emerge. 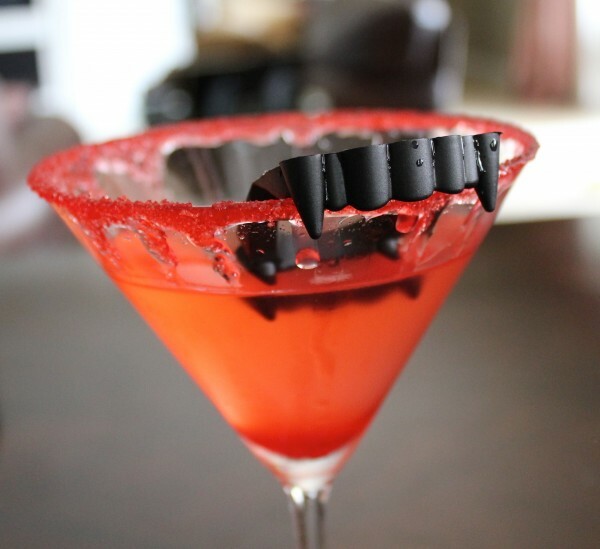 If a scary looking drink is really what you’re after, then a little effort on your part might be required. Like a witch’s cauldron, most of the recipes for Halloween call for lots and lots of ingredients to be used. Truly dedicated people will have to scour the Supermarket aisle for all sorts of exotic beverages and obscure fruit juices which to mix following the advice found on the Internet. After all, the most gut wrenching drink is always brewed at home. ½ cup of corn syrup, 1 tablespoon of cornstarch are mixed together in a bowl, to which ¼ cups of water is added until the mixture reaches the consistency of blood. Food coloring is added until the desired result is reached. Most recipes recommend around 15 drops of red and up to 5 drops of blue food coloring. The mixture is then poured over the drink when served, or directly into the crystal skull-shaped bottle.